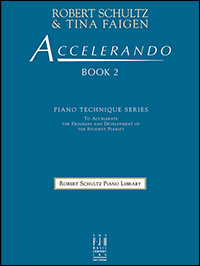 The Accelerando Series provides a wealth of highly-motivating studies, expertly crafted to support all areas of standard piano technique. Designed for both children and adults, the Accelerando books guide the student's progress from their first lesson to the advanced level. Each book presents clear-cut goals that pave the way for accelerated progress at every age and level. All subjects and elements studied throughout the Accelerando Series are developed with ample, creative reinforcement that ensures successful results with both immediate and long-term benefits. Primary Subjects: hands alone finger combinations in Middle C position progressing gradually to hands together 5-finger patterns in C Major position. Elements: consistent quarter-note motion, legato & staccato, steps & skips, expanding the reading range by steps, "hold" studies establishing secure keybed orientation. Also includes: keyboard/staff diagram, "master the metronome," staff paper. The Accelerando Series provides a wealth of highly-motivating studies, expertly crafted to support all areas of standard piano technique. Designed for both children and adults, the Accelerando books guide the student's progress from their first lesson to the advanced level. Each book presents clear-cut goals that pave the way for accelerated progress at every age and level. All subjects and elements studied throughout the Accelerando Series are developed with ample, creative reinforcement that ensures successful results with both immediate and long-term benefits. Primary Subjects: hands together finger combinations in C Major position alternating with hands alone "travel" studies moving away from Middle C, simple transpositions to develop equal mastery throughout the keyboard. New Elements: quarter-note motion, 2-note slurs, parallel & contrary motion, intervals & triads, "hold" studies to develop finger independence. Also includes: 5-finger major/minor transposition chart, "master the metronome," staff paper. Primary Subjects: stable & travel studies incorporating C major/minor positions, A major/minor positions, and altered tones within a 5-finger position. New Elements: 8th notes, contrasting articulations, major/minor triads, accidentals, thumb under, alternating hands, multi-voice "hold" studies, transpositions using accidentals within a 5-finger position. Also includes: 5-finger major/minor transposition chart, "master the metronome," staff paper. 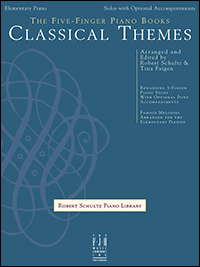 The Classical Themes edition includes 10 of the world’s most beautiful and well-known classical themes. Created for the elementary pianist of any age, these exceptional arrangements feature rewarding 5-finger solos with optional duet accompaniments. This Contents: Canon In D, Ode To Joy, Pomp And Circumstance, Dance Of The Sugar Plum Fairy, Beethoven’s Fifth Symphony, and more. 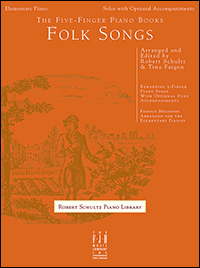 The Folk Songs edition includes 10 of the most famous American folk songs. Created for the elementary pianist of any age, these exceptional arrangements feature rewarding 5-finger solos with optional duet accompaniments. Contents include: Red River Valley; Oh! Susanna; Clementine; Turkey In The Straw; Home On The Range; and more. This edition is a fun supplement to any course of instruction and supports the requirements of the discerning piano teacher. 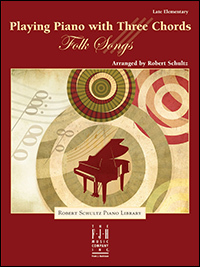 Folk Songs provides a wealth of long-loved music the entire family will enjoy. Primary Subjects: 5 subject areas presented in stable position & travel studies: expanding the hand position, triplets, arpeggio figures, chromatic figures, and introduction to dotted rhythm. New Elements: triplets, 6ths & 7ths, stable accompaniments, shifting thumb, transpositions using expanded 5-finger positions. Also includes: relative major/minor transposition chart, "master the metronome," staff paper. Playing Piano with Three Chords is an introduction to basic chord playing and hands-together playing written for the late elementary pianist. This collection features seasonal favorites that are harmonized with no more than three chords in easy key signatures. Titles include Snow Lay On the Ground; O Christmas Tree; Jingle Bells; Deck the Halls; Up On the Housetop; Silent Night; and eight others. A diagram of the basic chord progression is shown in the root position and then in the inversions used in the arrangement. Lyrics included. The Playing Piano with Three Chords series introduces chord playing through basic harmonization with easy, chord-based accompaniments. Each edition includes a wealth of familiar melodies in pianistic, educationally-sound arrangements that are harmonized with no more than three chords. Arrangements are expertly crafted and edited, including chord names and introductory diagrams that pave the way to understanding chords and their application. Also includes: circle of 5ths diagram, relative major/minor transposition chart, “master the metronome,” staff paper. 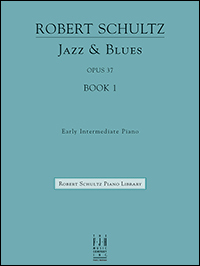 Includes 13 original piano solos in a wide variety of colorful jazz and blues styles – swing, bebop, and more. Presented in standard notation with clear and precise editing, Schultz’s writing is consistently pianistic and highly effective, resulting in a set of professional-quality jazz pieces that are certain to stimulate the progress of early intermediate students of all ages. Contents include: Blues Over Easy, Fast Lane, Goin’ Down To Monty’s, Shortcut Alley, and more. Original performance solos for the intermediate pianist. These imaginative performance pieces provide the intermediate pianist a stepping stone to the advanced classical and contemporary literature. Composed in Schultz’s attractive, contemporary style, these pianistic sketches include scenes, character portraits, and atmospheric settings ranging from the serenity of the opening Meditation to the excitement and drama of The Sorcerer. Primary Subjects: 4 principal subjects: melodic scale figures, arpeggio figures, octave figures, and specialized skills. New Elements: scale figures continue their progression through relative major/minor key signatures with three or four sharps/flats, blocked & broken octaves, specialized skills including: Alberti bass & broken chord patterns, trills, crossing hands, leaps, and combination studies. Also includes: circle of 5ths diagram, relative major/minor transposition chart, "master the metronome," staff paper. Primary Subjects: 5 principal subjects: melodic scale figures, accompanimental figures, octave & chordal figures, combination studies, and specialized skills. New Elements: scale figures continue their progression through relative major/minor key signatures with 5 sharps/flats, patterned accompaniments, waltz bass, melodic octaves, full chords, ornaments, finger substitutions, 2 against 3, 4-5 octave slurs, bridging 10ths, legato 6ths, and repeated notes. Also Includes: circle of 5ths diagram, master the metronome, a table of ornaments, and a glossary. 85 piano solos, reference materials, 176 pages Encyclopedia of Classical Piano Music, Volume 1 is created to serve as a permanent edition in the music library of every pianist—students, teachers, professionals, and amateurs. The collection contains 85 piano solos, 75 of which are standard classical works in their original form that are traditionally used to introduce pianists to the literature of the great composers. 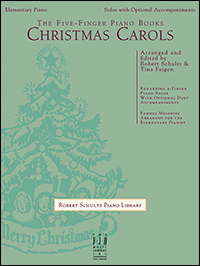 Also included are 10 piano arrangements by Robert Schultz of classical masterpieces from the orchestral, vocal, and chamber music literature. Thirty-one famous composers are represented, whose works span more than 400 years of music history. 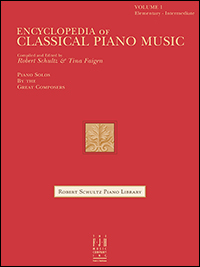 The contents are organized into the Baroque, Classical, Romantic, and 20th Century periods, with an additional section devoted to the piano arrangements. Each section is preceded by an elegant divider page adorned with correlating fine art. All of the music is precisely edited with utmost respect for the intention of the composer and the performance practice of the period. Valuable reference materials appear in this volume, including a table of music symbols, list of relevant tempo marks, complete glossary of music terms used within the book, title index, as well as a chart listing the dates of the composers.